The Mercedes-AMG GT Concept show car will feature aggressive wheels, centered exhaust and a rear that is similar to the AMG GT coupe and roadster. Mercedes-AMG is hinting at plans for an all-new, four-door GT based on a concept set to debut at the 2017 Geneva auto show. A teaser photo indicates the Mercedes-AMG GT Concept show car will feature aggressive wheels, centered exhaust and a rear that is similar to the AMG GT coupe and roadster. 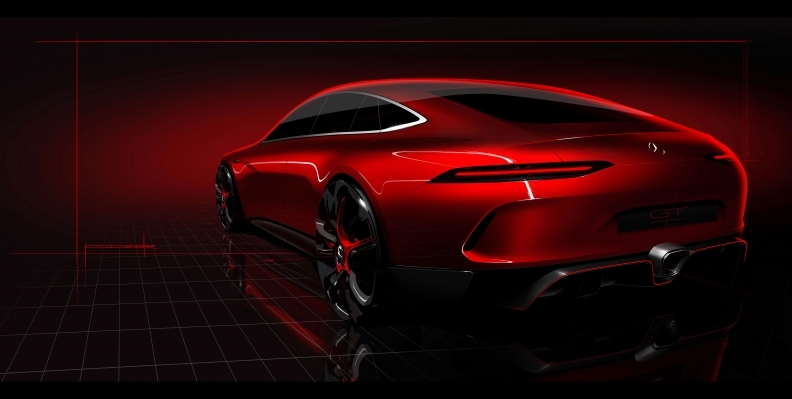 Mercedes-AMG calls the concept "an advance view of its four-door sports car."